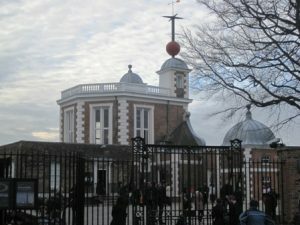 The Royal Observatory is sited on a hill in the centre of Greenwich Park. Flamsteed House in the north west corner of the site was the original observatory and was built in 1675 for the first Astronomer Royal, John Flamsteed. The function of the observatory was to set standards of measurement for time, distance and latitude and longitude, and early telescopes and time measuring instruments are displayed within the building. The Greenwich Meridian Line denoting zero degrees longitude runs through the courtyard of the observatory. Above the observatory is an octagonal room which was used by the Royal Society for meetings and dinners, this is surmounted by the famous time-ball which is dropped to indicate Greenwich Mean Time at 13.00 every day. In the days before radio, the dropping of the time-ball was an extremely important event allowing ships’ captains to accurately set their chronometers to enable future calculations to determine their position at sea. The time from the ball was recorded at, amongst other places, St Anne’s Church Limehouse whose special maritime clock was set to the time for the benefit of ships in the surrounding docks. Adjacent to the Old Observatory is the New Physical Observatory (1890-99), which is cruciform in plan and crowned by a terracotta dome housing the country’s largest refracting telescope. To the south of the site is the Astronomy Centre which houses a 120 seat planetarium with laser display facilities, and also Astronomy Galleries with various exhibits. Admission to the Astronomy Centre is free. There is a charge for access to the Old Observatory and for the planetarium (where daily shows take place).